Hello, La Dolce Vita readers! Thanks so much for having me, Erin with Fig + Cotton, again today with some tips on Effortless Entertaining. As someone who loves to entertain — and does it frequently — I have some items that I keep handy at all times in case of an impromptu get together at my home. Here are 12 items that every hostess should have on hand to throw a cocktail party in a pinch! 1 // A cocktail party is obviously not a cocktail party without the cocktail. Try saying that five times fast! First, I would always suggest always keeping a few reasonably-priced bottles of cava (Spanish sparkling wine) in your fridge. You can get some wonderful bottles for under $15, and nothing says party like the pop of a champagne cork! 2 // Always try to keep the ingredients to your go-to cocktail on hand. Also, make sure you can make that go-to cocktail without too much trouble. 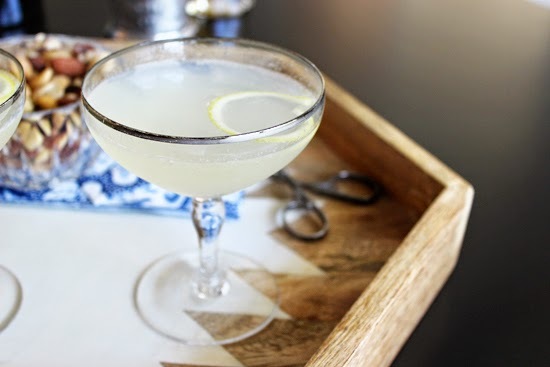 One of my favorite cocktails is the French 75. Almost all the ingredients can be stored for a long time, and it is just plain delicious. You can find my version of this cocktail here. 3 // A can of salted mixed nuts is the perfect — and easiest — bar snack to have on hand when your surprise guest(s) arrive. Keep some good nuts in your pantry. 4 // Keep a few frozen apps in your freezer. You can find delicious ones (here, here, and here) at Williams Sonoma, Whole Foods, and even at your local grocer. You will look like you had this all planned out as you are passing your treats on a platter to your guests. No one will know. 5 // Olive Oil. Yep. Olive oil, sea salt and freshly cracked pepper make the easiest and elegant dip. Serve it in a simple, shallow white bowl. 6 // Bread. See #5 above. 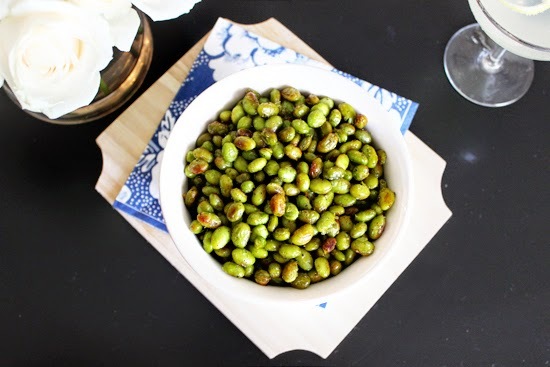 7 // Next time you are grabbing groceries, throw a bag of frozen shelled edamame in your cart. This can be the perfect appetizer to throw together. See this recipe for ideas. I use this one all the time with a variety a toppings. 8 // Make sure you have a good selection — and I don’t mean expensive — of cocktail glasses on hand. It would be ideal to have 8 champagne flutes, 8 wine glasses, and 8 old fashioned at arms’ length. 9 // Pretty patterned disposable cocktail napkins can spruce up any old get together. Next time you are in the HomeGoods check out line, grab a good variety of fun and pretty ones. 10 // A fabulous serving tray instantly elevates a cocktail, in my opinion. 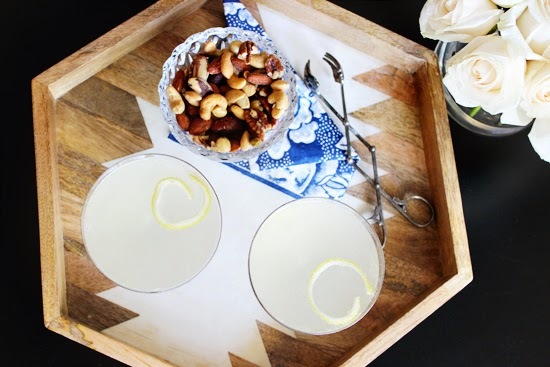 Place your cocktails on the tray for serving for a polished look. You can purchase beautiful and unique trays at so many places. The one I used here is from Target, and it usually sits on my coffee table. Think outside the box! 11 // Candles are a no-brainer, and they can definitely set the mood for your party. Keep a few on hand in your “hostess closet,” so you don’t need to scramble at the last minute. 12 // And finally, music. Be prepared with your favorite iTunes playlist or Pandora station. Nothing is worse than a party with no music. Nothing. Well, there you have it! I hope this helps you have a great time at your next Cocktail Party in a Pinch! I love entertaining! These are great tips. I always make sure to have some candles on hand to set the mood and some cute party straws! Tried your link for your edamame recipe and it just says “Page Not Found”. Thanks for the heads up, Ann! I just edited the broken link and it should be working fine now. Me too! Somehow, I am blown away by the idea of keeping some nice frozen appetizers on hand in case company drops by. It’s one of those “why didn’t think of that?” moments! Love this! We all love to entertain on the fly, but it shouldn’t be stressful! xxoo, Paloma! Thanks for letting me share!